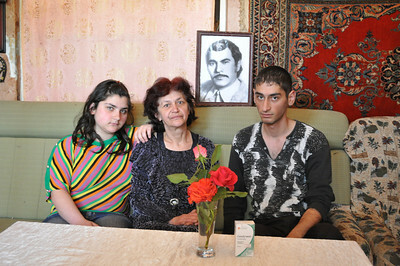 You are here:HomeBlog[CASP]: CASP Profile – The Harutunyan Family. [CASP]: CASP Profile – The Harutunyan Family. Meghri is the southern gate of Armenia where, each day, dozens of trucks pass through the border crossing into neighboring Iran. For years, processing plants employed the majority of the town’s population. Most have since shut down, leaving vast unemployment. Today, the most vulnerable are those who have no steady income. The Harutunyans are one such family. FAR staff spent some time with them during the spring distribution of CASP stipends. Hasmik Harutunyan has two kids. For many years Hasmik worked as a teacher in one of the Meghri schools. Recently retired, her pension does not cover the family’s rent. Her husband Hamlet passed away many years ago from a heart attack, leaving the burden on his wife’s shoulders. Nineteen-year-old Artyom studies at Yerevan National University’s Meghri branch where his tuition fee is around $400 a year. Normally, his family can only manage to pay half of it. CASP makes it possible for them to cover the rest. Recently, after a cold winter in a drafty house, Artyom came down with pneumonia. 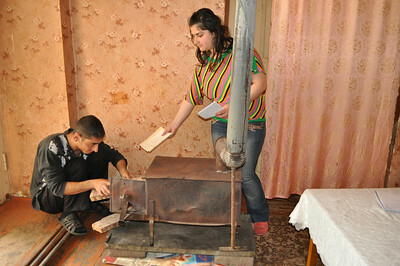 “Lately we have to buy only medications instead of bread,” Hasmik said.